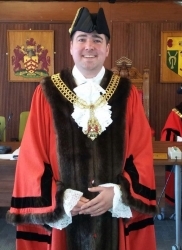 The new mayor of Gloucester Sebastian Field will be singing the city's praises – quite literally. Professional singer Seb, 32, was elected at a ceremony this afternoon. And he can't wait to get started in his new role. "I am very excited but slightly nervous about what I have let myself in for," said Liberal Democrat Seb.